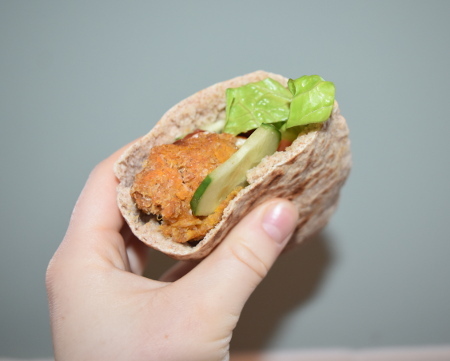 These sweet potato koftas are a delicious alternative to meat koftas. With just a simple seasoning, you can really appreciate the earthy flavour of the sweet potato; they’re best served in a pitta with plenty of salad and Vegan Garlic Mayonnaise! For this recipe, I’m using a plancha to cook the koftas – this provides more stability than just a grill, as there aren’t any gaps for bits of the koftas to fall through! It’s also possible crisp up the outside of the koftas a little by frying them in vegetable oil on the plancha. We are still cooking over direct heat however, so you can use any sort of barbecue with a plancha on top to cook these beauties! Serves 4. Prep time: 15 minutes. Cooking time (boiling and barbecuing): 30 minutes. Allergens: gluten (breadcrumbs – make breadcrumbs from gluten free bread to make this recipe gluten free). Start by boiling the sweet potatoes in a medium pan. 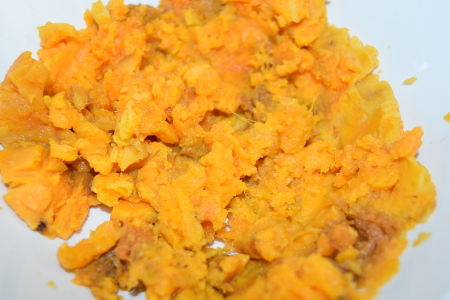 Leave to boil for about 20 minutes, until the sweet potato is soft and squishy. Light your barbecue and heat it up to about 180°C (356°F), or until the charcoal is hot. Put your plancha on top of the grill and allow to heat up. Drain the sweet potatoes and try to shake off as much excess water as possible. Put them in a large bowl and mash them. At this point, add all of the other ingredients and mix together the whole thing with a spoon. 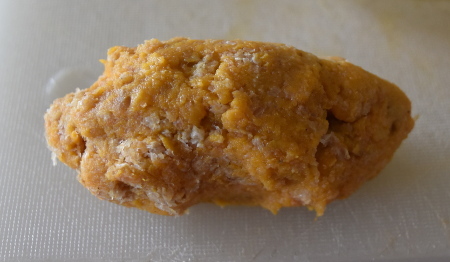 Once everything is thoroughly mixed, take a handful of the sweet potato mash and mould it into a short, chunky sausage shape. 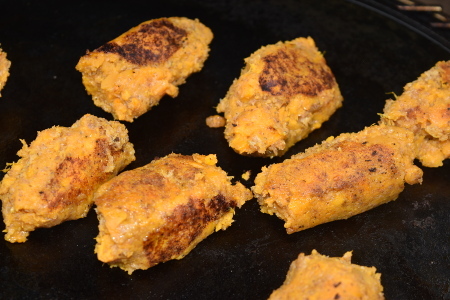 Repeat with the rest of the mixture, then pop the sweet potato koftas onto the plancha grill on your barbecue – I prefer to use the flat side of the plancha for these koftas as it makes it easier to turn them and also to brown them evenly all over. Cook for 5-10 minutes on each side, until the koftas turn golden brown. Make sure to keep turning them to stop them from burning! 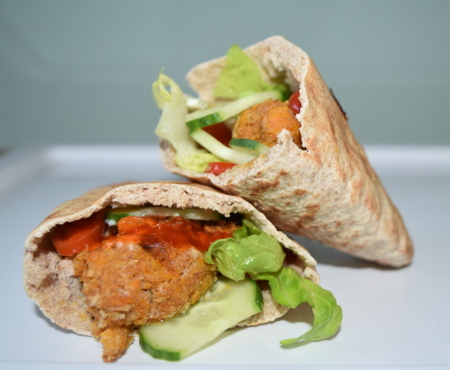 Once cooked, take the koftas off the barbecue; enjoy your sweet potato koftas in a pitta bread with plenty of salad and some vegan garlic mayonnaise – if you like it hot like me then go ahead and spice it up with some Sriracha or another hot chilli sauce! Sweet potatoes are not only delicious but amazingly nutritious! They may be similar in texture to the humble potato, but they're packed with loads of vitamins and have quite a few health benefits. I'm no expert however, so click here for more information about sweet potatoes.